Timing is everything so plan your exercise routine in the cooler parts of the day, remember early morning and late evenings are the most suitable time for you and your dog. Exercise must be limited till your Corso skeleton is fully developed, their growth is quite fast in the first 12 months, therefore introducing short low impact excercise till they have reached complete development is essential. Excersising your Corso has many benefits for you and your dog; it not only promotes a positive healthy lifestyle for your dog it also develops into a relationship your dog will embrace as you bond and connect through play. Stimulation is a key element in the development of a young Corso, introduction of a variety of stimulas will result in a well balanced dog, remember to have fun, play exercise routines will further their skills and social behaviours. After exercise, rest your dog and hydrate them well. Are the most common of all excercise you will do with your Corso. Add variety to this activity by throwing a ball, stick or frizbee do it on the beach, at the park or in your backyard. Make it an event not just a walk or jog, reward your Corso behaviour in a heel position by throwing their reward to fetch, teaching retrieval at the same time. They will soon understand your actions provide them with rewards upon positive behaviour all while exercising. In the images below Frank is cycling with our Italian Import "Sirio" cycling is a great activitiy for a well developed Corso, make this an event whether you go to a park, or corner store the excercise will benefit you both. This routine is particularly helpful with high energy dogs, you will sustain your energy while the dog expells theirs, cycling promotes a dogs fitness levels, start off slow as your dog's fitness improves increase the distance and speed. Further image below our dog "Delta" is enjoying a swim while fetching a stick. Swimming is the ultimate low impact exercise in our opinion, introduce this activity early encouraging your dog to swim throughout their life will benefit greatly as they enter into their senior years. We usually start our young puppies with a swim vest in shallow water, they need to be able to walk into the water area, as they build confidence in this activity you can introduce a variety of objects to fetch, dog diving is a new sport you may want to try with your Corso. This is quite an interesting activity for an active minded individual, we have some members of Team ITACOR that have introduced this into their dogs daily activity as it is a sport they compete in as professional Rollerbladders. 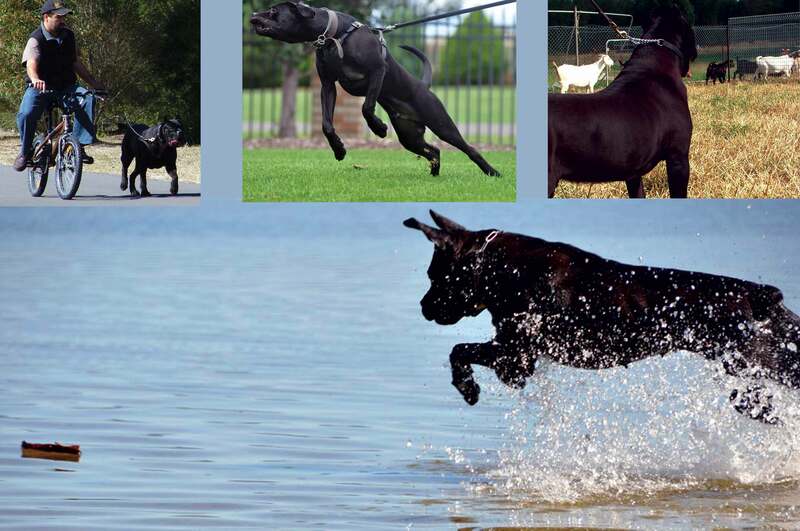 Such as Agility, Show Confirmation, Herding (image far right Italian Import "Sirio") & Schutzhund are a great way to excercise and stimulate your Corso while gaining skills in a competition sport. A variety of activities will assist you in determining an assessment of your Corso ability to compete in the sport. This will take time and patience on your behalf as a trainer and handler, if you Corso displays characteristics to participate in the sport why not give it a go! This would have to be one of the most important engagements of activities you can develop with your dog. A Corso is extremely capable to be obedience trained, through positive training your Corso will be a joy for you and society as a well mannered member of your family.